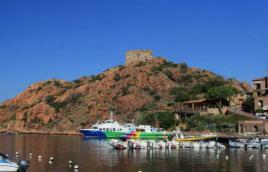 This region lies in the southern part of the coastal area of the Regional Nature Park of Corsica. The bay of Porto is a quite amazing region which will offer you astounding landscapes ! The Porto-Piana region is thus one of the major tourist areas of Corsica. Several dozen hotels and restaurants cluster around the tower and the mouth of the small river « Porto ». The huge bay surrounded by mountains and its amazing crimson sunsets are the reasons why it has always been such an attraction. Porto also lies in the middle of a unique tourist area of the island: the Calanche are less than 5 km away, Girolata and Scandola about 30 km, and the highest peak of Corsica, i.e. Monte Cinto (2710 m), 50 km. In summer many excursion boats leave from the small port of Porto for a tour of the Gulf, where one can admire its red cliffs. Hikers prefer to walk up to the Capo d’Orto (elev.1296m) from where you have a bird’s eye view of the Calanches and a panoramic view of the whole Gulf of Porto. 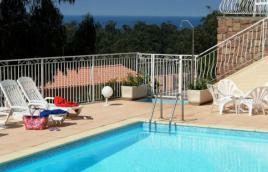 The Gulf of Porto is the ideal place for a holiday in the heart of an unspoilt nature. Crimson rocky ledges, crystal clear water, a small, white beach….at the northernmost end of the Scandola Nature Reserve lies the enchanting Marina d’Elbo. From the top of the solitary Genoese watchtower you can enjoy a spectacular view of this panorama and of the never-ending macchia that surrounds it. But again, it is a place that requires some effort to get to: theoretically you can walk there from Girolata, but the path is strenuous and dangerous. In summer, the hinterland gets stifling hot. - The Spelonca trail follows the major “Tra Mare e Monti” trail from Calenzana in the north to Cargèse in the south, via Ota and Évisa. This used to be a transhumance trail built in the 15th century. 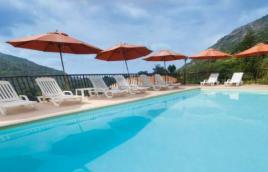 We recommend that you begin your journey from the village of Ota, which will allow you to have a break in Evisa. That will take you about 5 hours. On the way 28 signs will help you discover the immense diversity of the local fauna and flora. During your walk, you will be able to admire the magnificent Genovese bridge of Zaglia, built in 1754 and if you have the time, maybe even take a dip in the clear waters of the Tavulella. Then, from the highest point of the trail you can see the Rock of Ota. On your way up you will walk through oak tree forests where you will come across some strawberry trees. The trail goes down along the Spelunca Gorge. - The fortress on the Girolata peninsula was built in the 12th century by the villagers living on the peninsula, because they wanted to protect themselves against the Barbarian invasions and the Moors. Later the shepherds settled around this edifice and thus the village of Girolata was founded. During your holiday you can still come across flocks of sheep and wild goats, which will bring to mind the past and the period of transhumance. The Porto-Piana region has all the ingredients to make a holiday in this region an unforgettable event, so don’t hesitate and come ! Into a majestic setting in the centre of Porto Sea at 10mn. Somewhere else we pass, here we stay. 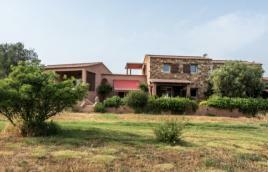 Exceptionally good located with unspoiled view on the bay of Porto and the Capo d’Orto. 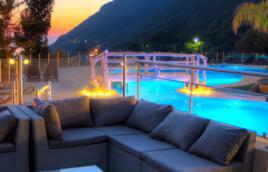 Exceptional view with an idyllic context, at the edge of Genovese tower, on the port. Face to the sea.